Radio frequency. Safe and painless, VShape is an alternative treatment to surgical procedures for skin tightening and facial contouring. Pull back years from your face this is the only non-invasive contouring treatment dedicated to the unique features of your body’s most prized possession….. You’re Face. V Shape is not only the safest, but also the most effective non-invasive option for facial contouring. VShape is performed in 80 Countries and has successfully treated tens of thousands of patients. Q. How long until The Result is Visible? You may see results immediately after the first treatment, though most improvement will be noticed in the days and weeks following each treatment session. Q. How many Treatment Sessions? Generally 4-6 treatment sessions are recommended. VShape Facial Countering requires about 5 sessiond done 2 weeks apart. Results are appreciated in one session. VShape is safe and effective with no side effects or downtime. VShape is a pain- free procedure that is often compared to receiving a hot stone massage. Q. How Long does each Treatment Session Take? A typical session lasts 20-30 minutes. As the procedure is pain- free, you won’t need to spend any time Preparing or recovering from the treatment. 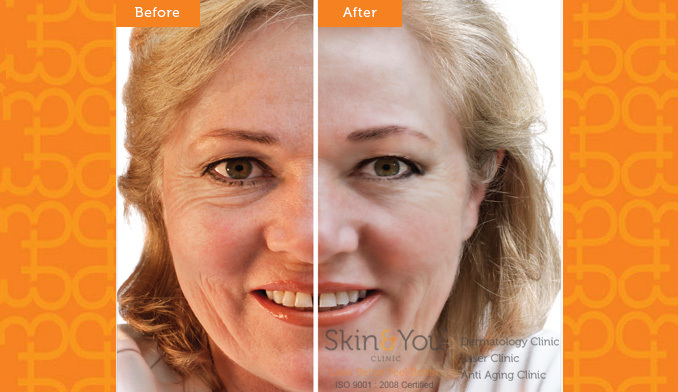 Why Skin & You Clinic for V Shaped Facial Tightening? We at Skin & You Clinic have the latest Alma accent ultra that builds new collagen, tightens and lifts the skin with no downtime. It is a lunch time procedure with no tell a tale signs. We have done countless patients and achieved envious results.